A rendering of the proposed building. Boston University has unveiled images of a 19-story tower the school is proposing to build on Commonwealth Avenue that would be the tallest on campus. The building would be home to the university’s Data Sciences Center. Under BU’s proposal, the center would house the school’s mathematics and statistics and computer science departments under one roof, according to a statement from university spokeswoman Rachel Lapal. 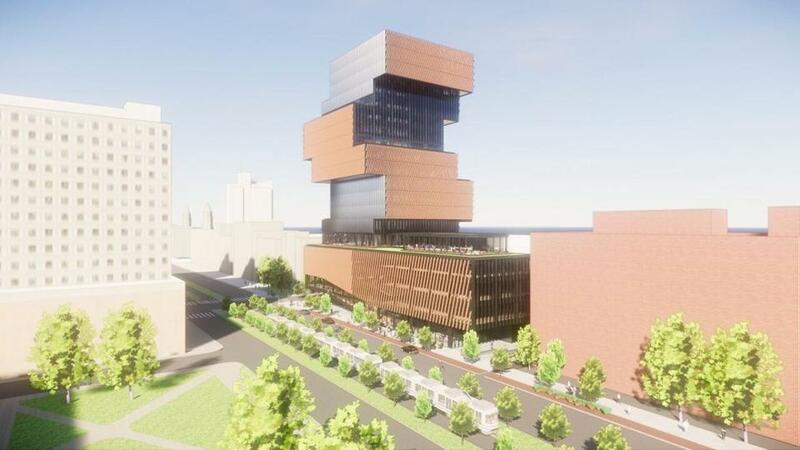 The building, designed by the Toronto-based KPBM Architects, is intended to resemble a stack of books, according to Lapal’s statement. A city approval process for the project could take up to a year, Lapal said in the statement. The university has filed a letter of intent with the city, and BU could start work next summer and open the building in the spring of 2022, said university spokesman Colin Riley said in an e-mail. BU does not expect to have “a full design and cost estimate” for the project until next spring, according to Riley. A parking lot currently sits at the site of the proposed 350,000-square-foot building, which would be located at the corner of Commonwealth Avenue and Granby Street, across the street from its Warren Towers complex west of Kenmore Square. Tim Logan of Globe staff contributed to this report. Danny McDonald can be reached at daniel.mcdonald@globe.com. Follow him on Twitter @Danny__McDonald.